University of Michigan student marching in the 2017 Fair Food Parade in Columbus, Ohio. One down, three to go, and the “4 for Fair Food” Tour hasn’t even started yet! After years of building their case to kick Wendy’s off campus, students at the University of Michigan have won their battle to “Boot the Braids” until the fast-food giant joins the Fair Food Program. The move turns next month’s planned demonstration on the UM campus into a celebration, and sends an unmistakable message to the administrations at other schools where students are demanding that Wendy’s put human rights on the menu, or take its business elsewhere. With the CIW’s human rights tour just weeks away, a dramatic wave of support for the Fair Food Program surged across the UM community this past month, marked by skyrocketing support for a student petition, overwhelming backing from the Student Government for a strongly-worded resolution, and a powerful statement, quoted above, from the Michigan Union Board of Representatives (which, as it happens, plays a key role in choosing vendors for the university’s massive student union). Even the city of Ann Arbor got in on the action with an unequivocal resolution by the City Council. Intrepid students from the University of Michigan post up outside of the campus Wendy’s, urging passing students to join the national boycott in 2016. Michiganders have made one thing abundantly clear: Wendy’s has worn out its welcome in Ann Arbor, and will most certainly not be invited back until it cleans up its act and joins the Fair Food Program like the rest of the fast-food industry giants. Now the attention of the Fair Food Nation turns to the other universities on the tour – principal among them UM’s key rival just a few hours away, Ohio State University – contemplating whether to continue doing business with a company as deeply compromised as Wendy’s. The exciting news at the University of Michigan unfolded over the course of a dramatic two weeks, but it was the culmination of more than four years of hard organizing work by students like Kim and community members with Washtenaw Solidarity with Farmworkers. Following the study’s publication, UM students continued organizing a growing campus movement calling on the University administration to honor the Advisory Committee’s conclusions and stand behind the Fair Food Program. And the movement didn’t confine itself to the four corners of the campus, as student leaders began calling on the broader community of Ann Arbor to join them in boycotting the final fast food holdout. ANN ARBOR, MI – When the Michigan Union reopens to the public in 2020, a group of local activists doesn’t want Wendy’s to be one of the dining options inside. … Beyond denying the bid from Wendy’s, Washtenaw Solidarity With Farmworkers want UM to update its code of conduct requiring all restaurants provide full public transparency regarding labor justice within supply chains. A team comprised of UM students as well as employees from the university’s Procurement Services, University Unions and Auxiliary Services currently are evaluating the bids and will likely make selections for the three spots in the next few months,” Broekhuizen said. Predictably, Wendy’s representative Heidi Schauer – the very same Heidi Schauer who, amazingly, claimed that farmworker women going without food on the streets of New York were “exploiting the #MeToo movement” because they dared to fight for an end to sexual violence in the fields, a comment that sparked a sharp response from #MeToo leaders like Alyssa Milano – tried to spin the news by claiming that Wendy’s removal from UM had nothing to do with the mounting pressure on campus to remove the fast food chain from the student union for good. But the student movement had a message of its own for Wendy’s and its PR director: Don’t get it twisted, Wendy’s, we don’t want you here. 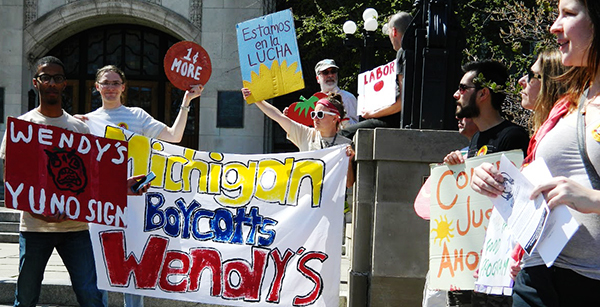 RESOLVED, That the City Council encourages members of the Ann Arbor community, including large institutions providing space for food service franchise, to boycott Wendy’s until they demonstrate their commitment to farmworkers’ rights by joining the Fair Food Program. RESOLVED, This resolution will be presented at the next Board of Regents meeting on February 21, 2019. Based on the public comments we received at our January meeting, it is the position of the Michigan Union Board of Representatives to not support companies that engage in practices deemed unethical by the Fair Food Program. MUBR believes that vendors’ endorsement of labor justice should be weighed heavily when choosing food vendors who will progress through the selection process. And with that, the final nail in Wendy’s coffin on UM campus was driven. 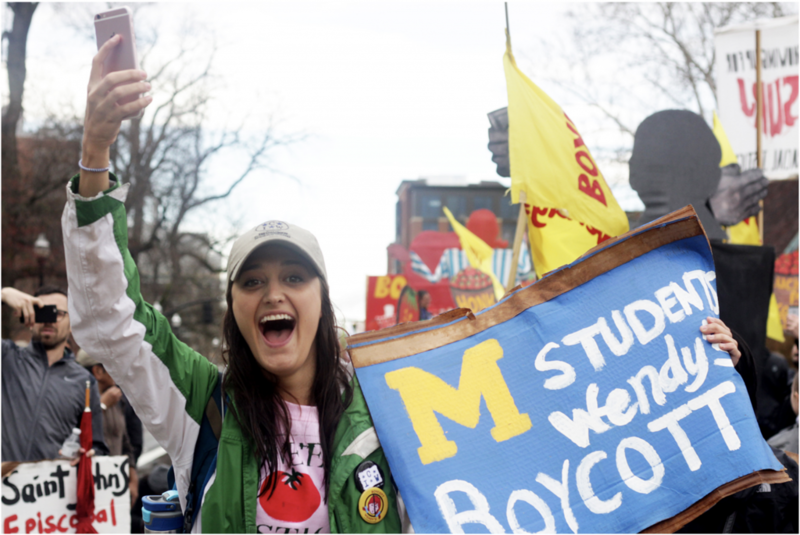 This major victory at the University of Michigan is only the beginning. Since the early days of the anti-sweatshop movement in the 1990s, UM has been a leader in student-led efforts to demand respect for the fundamental human rights of workers who supply the goods they consume on campus. And as was the case then for apparel, UM’s leadership will set the example for universities across the country as they assess their food supply chains in the months and years ahead. In particular, the message sent by the University of Michigan today will echo across the campuses of the other three colleges where students are organizing in support of next month’s “4 for Fair Food” Tour. With the tour just around the corner, news of the precedent set on UM’s campus has already triggered a surge of energy at OSU, UNC, and UF, as well as in the broader Boot the Braids Campaign that is gaining momentum across the nation. And when all is said and done, there is no amount of public relations spin that will shield Wendy’s from the reality that a door to a lucrative business opportunity has been closed to the fast-food chain, explicitly because the company has failed to meet the industry standard of social responsibility: the Presidential Medal-winning Fair Food Program. Stay tuned for more on this exciting development – and plans for UNC, OSU and UF!